A CCTV image of a man wanted by police after an armed gang stormed a college for a "pre-arranged fight" has been released. Police said about 12 men, some with knives and wearing balaclavas, arrived at Runshaw College, Leyland to confront a rival group on 4 March. A machete was later found near the scene by police. Footage on social media appeared to show students fleeing a confrontation with masked men. Det Con Terry McKibbin, of Lancashire Police, urged anyone who recognised the man the force want to speak to to come forward. 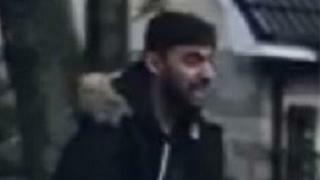 He said: "While we have made a number of arrests, we're keen to identify this man in connection with the incident." A boy, aged 17, suffered a minor cut to his arm during the disorder and was treated at Chorley Hospital. Seven people were initially arrested by police in connection with incident and bailed. Two men aged 18, and a 17-year-old, all from Bolton, were later arrested on suspicion of public order offences and have been released under investigation.